I have finally found the courage to open the online shop I have been preparing for the last three months. I was beginning to wonder whether I would ever feel brave enough to open it or whether I would continue to add products to a shop that never actually opened for custom. So what is the background to this new venture? 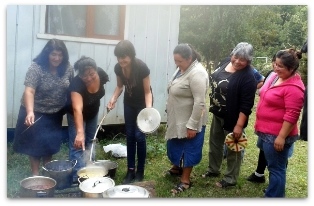 For several years I have been limited physically by arthritis, so I have been spending more and more time at home pursuing my favourite crafts – spinning, dyeing, weaving and knitting. 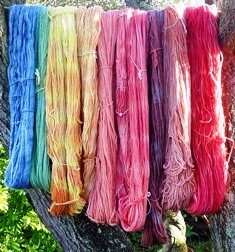 Over the years I have built up a large supply of naturally-dyed and handspun yarns, all just waiting to be used. Knitting has long been one of my favourite craft activities but it had been many years since I last did any weaving. However, once I had become re-acquainted with this craft, I found it totally absorbing. Gradually I have accumulated more scarves and shawls than I could ever hope to find homes for and I began to wonder what I could do with them, as my limited mobility made it more difficult to sell them at craft fairs. So this is how the idea of an online shop developed. One day my friend, Joy, (www.theknittinggoddess.co.uk) suggested that I might consider opening an online shop. At first I felt that might be too much of a challenge for me but with Joy’s generous help I managed to create the shop website. The next step was to begin to stock my shop. I then started to think about potential customers. I have made everything with loving care and a passionate belief in the quality of my materials but would my scarves and shawls appeal to anyone else? I am not a highly creative and artistic weaver or knitter. I don’t work with sophisticated equipment or intricate designs and my approach to my work is straightforward. I use simple basic equipment and I like to experiment with textures and colours in simple, classic designs. My love of handspinning means I can experience the unique nature of each fibre I spin and in my designs I try to make full use of the characteristics of each spun yarn. My love of wool and alpaca in all their beautiful natural colours, together with my passion for natural dyes and the wonderful subtle colours they produce, underpins everything I do. 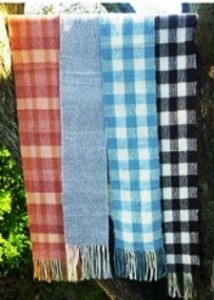 So all the colours I use are either the natural fleece colours or colours created by me from natural dyes. I never make the same thing twice so every item in my shop is unique. Everything has been made by hand, mainly by me but with a little assistance occasionally from my husband, Roger, who also weaves and helps me with warping up the loom. I am passionate about using local materials wherever possible, so I try to source my fibres from local sheep and alpaca breeders. In order to find the most appropriate fibres for each project I may have to look further afield for some materials but the vast majority of my fibres come from Britain and I often also know which farm each fibre has come from and sometimes the name of the sheep or alpaca which provided the fleece. Initially I have only scarves in my shop but I hope to add some shawls, some handspun yarns and possibly some small coverlets for babies. 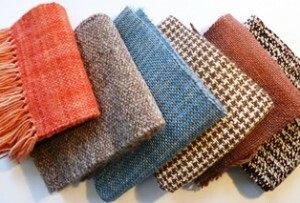 I open this shop with some trepidation and I hope my products will appeal to those who appreciate the unique characteristics of items lovingly handcrafted from beautiful natural fibres and colours. To see what I have to offer, please click on the link to Jenny Dean Designs under My Online Shop on the right hand side of the page. 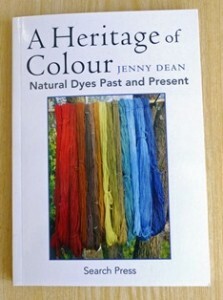 I am pleased to announce that my new book “A Heritage of Colour” is now available. 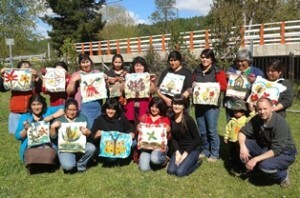 A few weeks ago I received an email asking about sources of natural dyes in Chile. 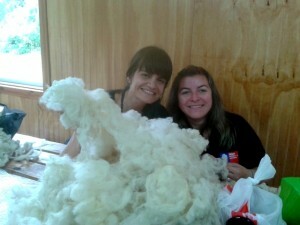 The writer, Marianne Meier, works with a group of Chilean women who keep sheep but who have been throwing away the fleece, rather than making use of it. 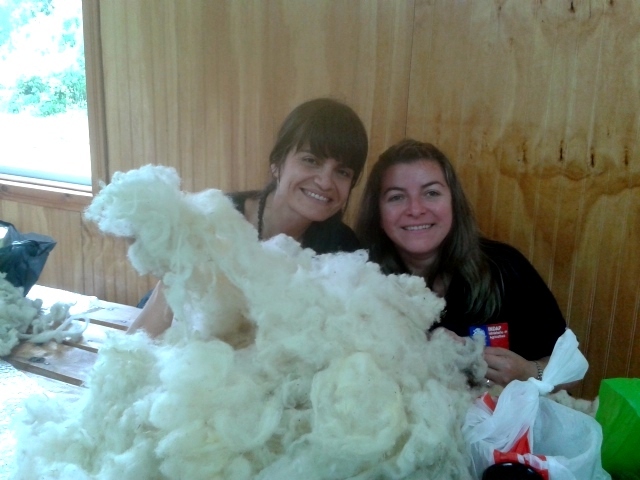 Marianne has taught the group how to use the fleece to make felt and, rather than using chemical dyes, she is starting to teach them how to use plants to dye the felt and the fleece. The photos below show the ladies in the group with some of the felt they have made and testing some plants for dye potential. 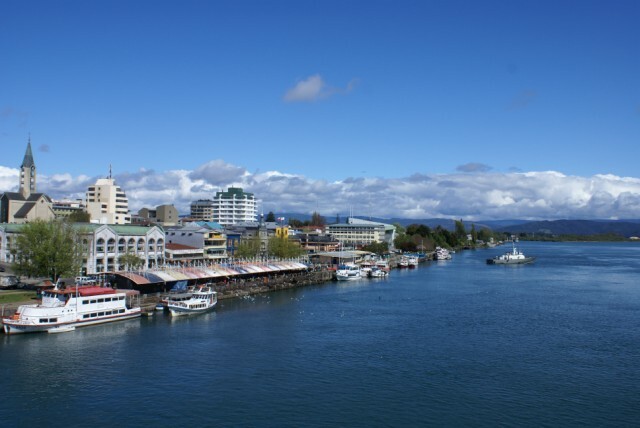 The group is based in Valdivia, which has an oceanic climate and where the summer temperature can exceed 30C and the maximum winter temperature is 10C. The region also has abundant rainfall throughout the year. 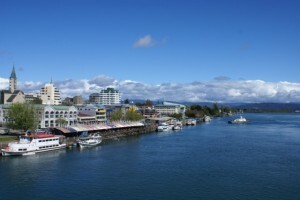 The natural vegetation is the Valdivian temperate rainforest. I think Marianne would like to use plants that the ladies in her group could gather locally if possible. Cochineal doesn’t seem to be available but I wonder whether it might be possible for her ladies to find species of Relbunium, which is the source of madder reds in parts of South America. I suggested dahlias, which are native to some areas of South America, particularly Mexico, and the group has tried dahlia flowers with some success. I also suggested that the ladies could save the skins from any onions they use, as onion skins could provide a useful and cheap source of colour. The photo above shows the preparation of the dahlia dye bath. I have urged Marianne to try and obtain a copy of Ana Roquero’s book Tintes e Tintereros de America, which has detailed information about South American dyeing traditions and photos of South American dye plants. Otherwise, I don’t feel be able to give the group much more information, other than that which applies to most plants from which one wishes to extract colour. 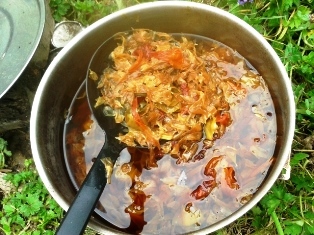 I wonder whether any readers have experience of using plants for dyeing in Chile or other regions of South America with similar climatic conditions and might be able to suggest which plants to test for their dye potential? If so, Marianne and her group would be thrilled if you would be willing to share your knowledge, perhaps by contacting me through this website? If anyone has any information or suggestions to offer, Marianne and her group would be most grateful.